Down the Rabbit Hole We Go...: I wasn't raised on a commune, but you'd think that I was considering how I ate. 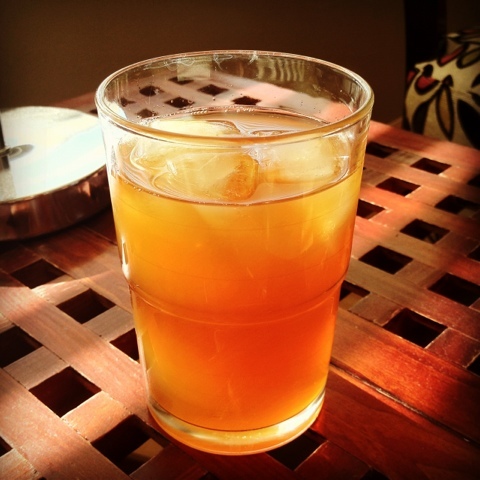 Also, a recipe for Almond Iced Tea. I wasn't raised on a commune, but you'd think that I was considering how I ate. 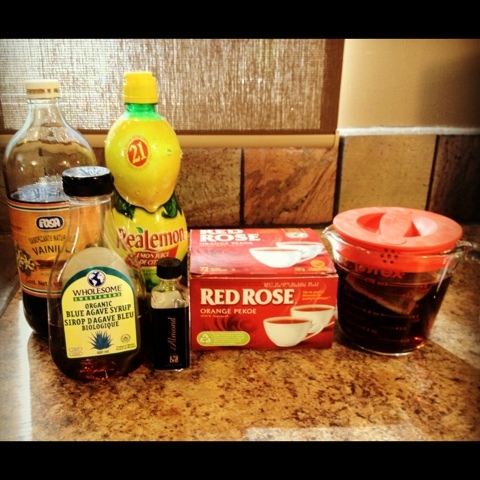 Also, a recipe for Almond Iced Tea. I will tell you now that this family recipe is an acquired taste. I've made it for many friends and none of them like it, and yet all my family loves it. So I'm sharing the recipe with you here, but I can't guarantee that after you try it you'll want to keep drinking it. I remember drinking this when I was young and hating it. I couldn't understand why anyone would enjoy it. Although to be fair, I also disliked blue cheese and horseradish sauce, both of which I can't get enough of now. I hadn't had this iced tea in years, and then one day my cousin served it at lunch at her house and I loved it. When I asked her for the recipe, she told me it was the family recipe and as soon as I saw the ingredient list I recognized that it was, only for some reason hers tasted infinitely better than when my mom had made it. Then I realized why. In typical "granola" fashion, my mom had cut the sugar amount so much that my young palate found it distasteful. Probably my mom was glad that none of us kids liked it, all the more for her! You have to understand something about my mom from my growing up years. We lived on a farm and my mom had a vegetable garden, canned all her own fruit (pears, peaches, apricots, cherries, plums and apples), canned applesauce, jam, fruit syrups and relishes, raised chickens for meat & eggs, milked a cow, made yogurt, baked 12 loaves a week of whole wheat bread, which for a while, she ground her own grain for. All of our beef, much of our pork and lamb had been raised by my parents or brothers on our farm. It was the same for my cousins, our crunchy granola mothers fed us beet bread, bean cookies and carob zucchini cake. You could never trust that even the baking you were eating wasn't laced with whole wheat flour and pureed vegetables. We barely ate any processed food. I never had a pizza pop until I left home at 18. I have to admit that I went a little crazy after I got married at age 21 and realized that I could go into a grocery store and buy ANY PROCESSED FOOD I WANTED! That got old pretty quick when I realized that homemade always tasted better. Now that I'm a mother, I'm realizing more and more that I want to feed my kids the way I was fed growing up. Although when I go into Subway, I always order my sub on white bread. Steep 4 teabags in 2 cups of boiling water. I let it sit in a covered measuring cup on the counter until the water has cooled. Add the cooled tea and stir together, add cold water until it's reached the desired strength.